Welcome to the world of Thomas Müller Litz! Step inside his shop on the Bahnhofstraße in Lauscha, and you will be instantly immersed in a flameworking tradition that spans 400 years. Sparkling handblown glass twinkles and shimmers on every shelf. Firelady Productions is proud to release "Master of Montage" as the initial offering of our new "International Series," which focuses on glass cultures around the world. In "Master of Montage" you will be treated to a demonstration of Thomas creating a complex montage vessel. He assembles multiple sections end-to-end, reverses the axis on the middle section...and he makes it look so easy! (It isn't!) 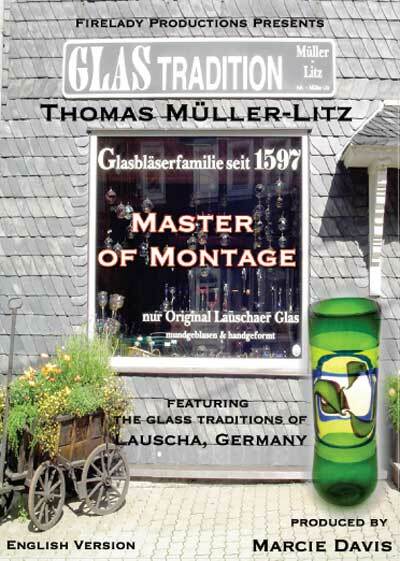 Thomas is a descendent of Christoph Müller, who was one of Lauscha's founders back in 1597. He's the last of a 400 year lampworking lineage in his family. His work is disciplined and precise, the close-ups are awesome, and in addition to all of that...he yodels for us as well! This DVD also includes some special features, such as a great slideshow of Thomas' work, a music video of his son Felix, who has left 400 years of history behind to be a drummer in the rock band "Revolving Door", and two bonus tracks from their band as well. All-in-all, it's a lot of bang for the buck, great fun, great tradition, and great music! Get your copy today!